The masthead of that issue looks so very dated. The font is quaint. 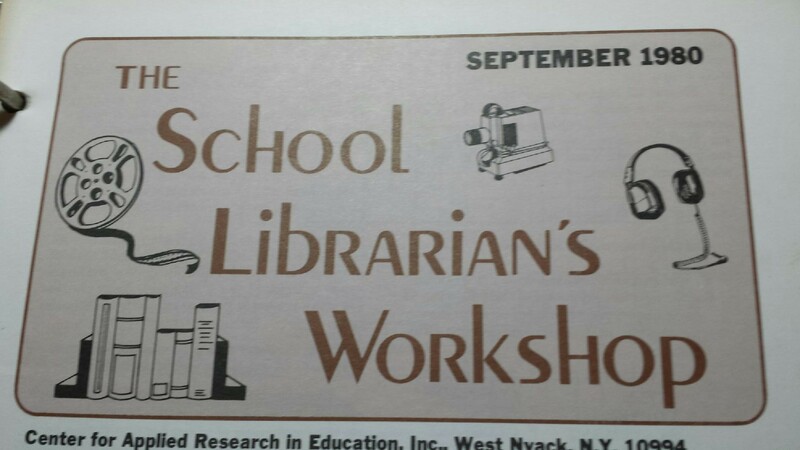 And yet it points to an ongoing theme in school librarianship. It’s laughable now to see the filmstrip projector and the 16mm reel. Of course headphones are still in use, but those were for listening stations. Technology has definitely come a long way. 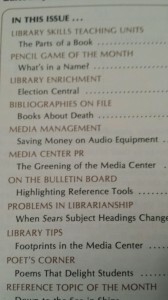 But – it is clear that from the beginning technology has been integral to what we do as librarians. Five years from now the tech we are using will be archaic. What remains the same is we will be the tech integrators. Instead of Tech Today, the first issue had a column on Media Management. The article was entitled “Saving Money on Audio Equipment.” The equipment has changed, but we are still looking for ways to stretch our budget dollars. Some columns have parallels to ones in today’s issue. 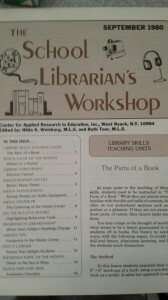 The Pencil Game was like the Puzzler, Reference Topic of the Month compares with Research to Go, and Library Skills Teaching Unit has been replaced by the Information Literacy Unit. Under slightly different headings, the first issue had a bulletin board, poetry, and book reviews. 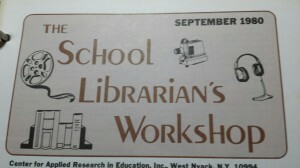 Promoting the school library program has been an ongoing thread. 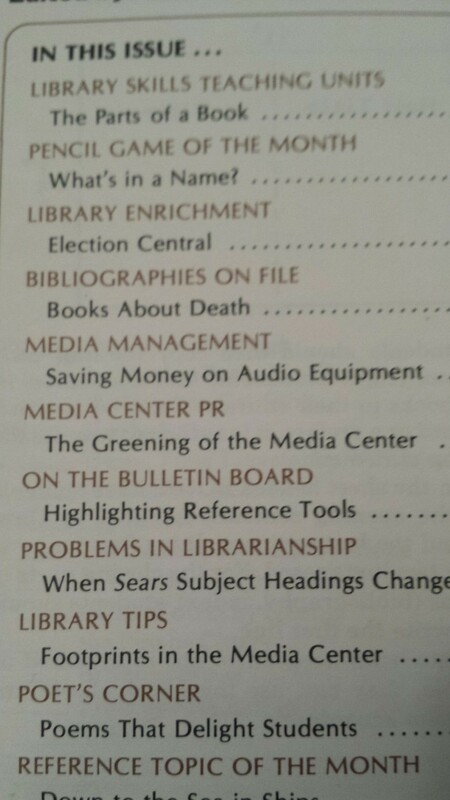 September 1980 had a column called Media Center PR. Today we talk about advocacy and connecting with our administrators and community. 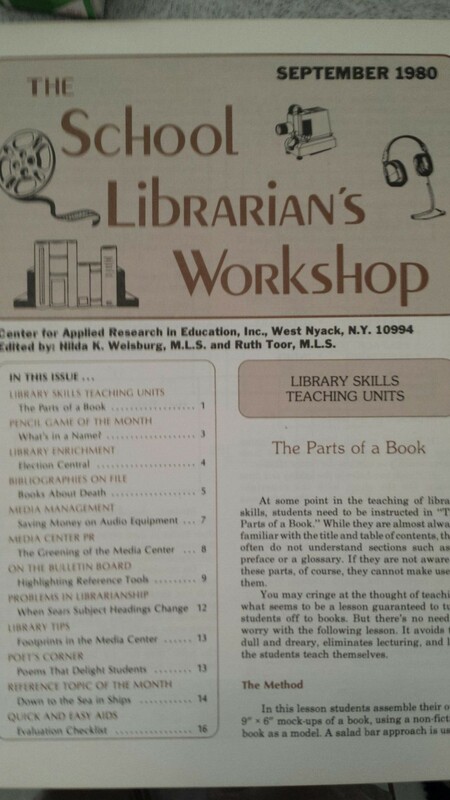 Teaching students how to do research showed up as a two-part article in March and April 1981. We wrote then that students tend to want to grab an encyclopedia article and run with it. Then it was print. Today it’s Wikipedia. Then and now, we work on teaching student how (not what) to think, how to determine what they need to discover, and where they can find it. The new twist is having them realize not all sources are equally accurate, but we have always been working to have them cite everything. I was right about computers, but more importantly it says something that remains true today. We are role models for lifelong learners. Change is inevitable, but our core roles have not changed. We remain leaders in embracing change and integrating it into our lives and the lives of our students. ‹ Paradigms and Predictions – Exciting or Terrifying?